This text is an accessible and comprehensive guide to the principles, practices, functions and challenges of maintenance engineering and management. 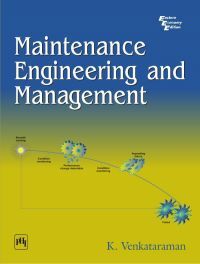 With a strong emphasis on basic concepts and practical techniques throughout, the book demonstrates in detail how effective technical competencies in maintenance management can be built in engineering organizations. The book thus provides students and practising engineers alike with the methodologies and tools needed to understand and implement the systems approach to maintenance management. To provide a good understanding of different types of maintenance management systems such as breakdown, preventive, predictive, proactive. To explain benefits of planned maintenance. To explain condition-based monitoring techniques with focus on vibration monitoring, thermography, and motor condition monitoring. To stress the role of reliability engineering in maintenance with tools like Failure Mode and Effect Analysis, Root Cause Analysis, and Criticality Matrix. To explain activities of maintenance planning with focus on shutdown planning, human resources development, and tools employed for monitoring. To emphasize management functions such as procurement of spares, measurement of maintenance effectiveness, etc. To give an overview of project management tools such as PERT etc. To introduce computerized maintenance management systems. To explain the basics of hazard analysis and fault tree analysis. Review questions in each chapter, worked-out examples wherever applicable, case studies and an exclusive appendix on "Selected Questions and Answers" are all designed to provoke critical thinking. This text is suitable for undergraduate and postgraduate courses in Maintenance Engineering taught in the department of mechanical engineering in almost all universities. K. VENKATARAMAN is presently serving in the faculty for off-campus programmes of BITS Pilani, Chennai Centre. He graduated in mechanical engineering from College of Engineering, Guindy in the year 1970, and later received his master's degree from Concordia University, Montreal. He served for 29 years with MECON, a renowned engineering consultancy organization, before joining academics in the year 2000.
by MISHRA R. C.|PATHAK K.